A week after sweeping a home slate and looking like the team was going to get back on track, Quinnipiac was swept in a home and home series with UMass Amherst sending the Bobcats to a 5-7-1 record and putting this season on the verge of sputtering out of control after 6 losses in their last 8 games. Quinnipiac has an early week game against Princeton followed by a weekend home slate against Harvard and Dartmouth. A lot of the future Bobcats played over the Thanksgiving holiday weekend so let's take a look at how some of them did. Wyatt Bongiovanni had two more points in Saturday's 3-2 win for Muskegon over Lincoln. He has a a goal and an assist with the goal coming way of the power play. It was a strong month of November for Bongiovaani with 5 goals and 5 assists. On the season he has 11 points (6 goals, 5 assists) and is tied for third on the team in scoring. Zach Metsa is on a hot streak. He has recorded a point in his 5th straight game with a pair of assists in two games over the weekend and now has points in 7 of his last 8 games for the Youngstown Phantoms. In 17 games played, Metsa has 9 points (1 goal, 8 assists). William Fällström returned from a minor injury with the Fargo Force to record an assist this past week. In 17 games played the Stockholm, Sweden native has 10 points (3 goals, 7 assists). 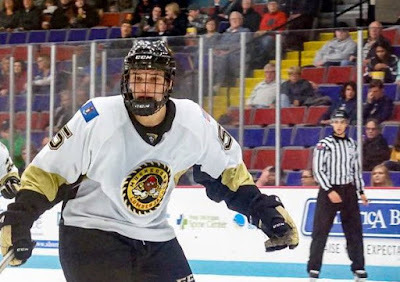 Domenick Fensore had an assist in two games played over the weekend as the U-17 US Developmental team played Sioux Falls and Omaha in USHL play. In 7 USHL games he has 1 assist. Justin Robbins got his third start of the season for the Chicago Steel. He played in Friday's shootout loss to Lincoln. He gave up 4 goals in the game for the Steel. On the season the New Jersey native has an 0-1 record with a 6.00 goals against average and an .824 save percentage. Matt Cassidy had one assist in three games played over the past week for the Brooks Bandits. In 20 games played, the New Jersey native has 14 points (6 goals, 8 assists). 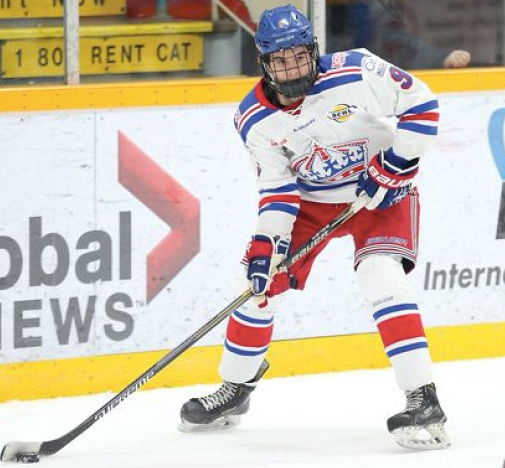 Ethan de Jong of the Prince George Spruce Kings continues to rack up the points. He had another 4 this past weekend in two games played (2 goals, 2 assists). He is also riding a 5 game point streak along with points in 9 of his last 10 games played. On the season he has 35 points (11 goals, 24 assists) in 29 games played and is tied for 6th in the BCHL in scoring. Michael Lombardi picked up his 7th goal of the season in Friday's 7-2 win for West Kelowna. The Rhode Island native now has 16 points (7 goals, 9 assists) in 27 games played. Jacob Quillan added three more assists this past week in three games played for the Steele Subaru Major Midgets. On the season Quillan now has 24 points (8 goals, 16 assists) in 21 games played. Austin Spiridakis picked up another an assist this past weekend for the St. Albert Tire Warehouse Raiders AAA team. In 17 games played, Spiridakis has 7 points (4 goals, 3 assists).